A calming camomile and spearmint infusion empowered with valerian root, a revered herbal remedy traditionally used to ease insomnia, anxiety and restlessness. Hops is also believed to have anti-inflammatory and antioxidant properties. 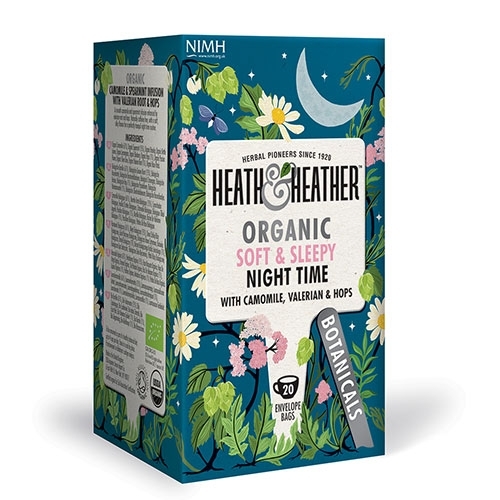 Below are reviews of Heath & Heather Organic Night Time Tea - 20 Bags by bodykind customers. If you have tried this product we'd love to hear what you think so please leave a review. Nice tea but don't like the plastic used on each teabag sachet, it is excessive and I know that there are packaging alternatives. Our teabag envelopes are made from paper with a thin polymer layer to stop moisture compromising the quality of the product, and to maintain fragrance and flavour of the ingredients. We are actively participating in trials on new recyclable and fully compostable materials which we hope to roll out across our product range very soon! Keep an eye on our social media channels for updates. We are dedicated on our journey towards being a plastic free brand and can’t wait to share more news about the eco-friendly solutions we have been working on. 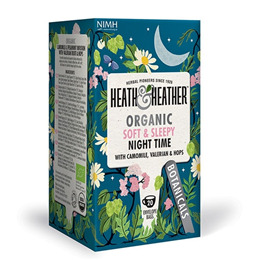 Heath & Heather teabags are made from soft woods, hard woods and long fibre e.g. Abaca (also called Manila hemp). Our teabags use a non-heatseal paper as they are simply folded and sewn with string. This means they do not contain any polypropylene, which is required for more traditional ‘heat sealing’ processes employed by many other tea companies. Great stuff, I've only been using this for 4 months to help with insomnia caused by citalopram does help, very pleasant taste, staying with this. I have been drinking this tea for the last ten years. being caffeine free it makes a really good thing to drink after six at night to help with sleep problems. used to buy it from holland and barrett but now its easier to buy direct.